If you don't already know, I love root beer! It's probably the only soft drink that I consume. 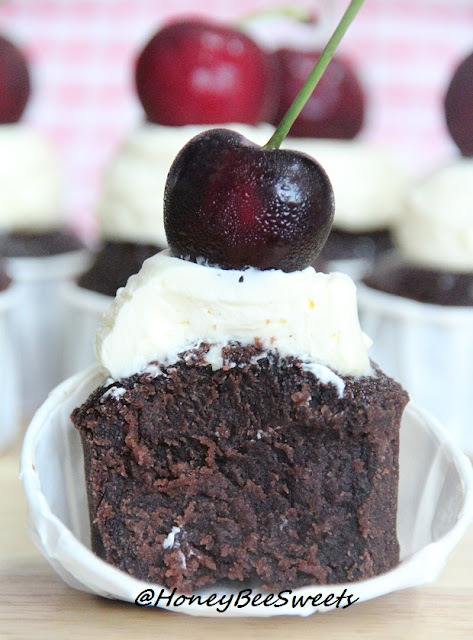 :) Last year I did a Root Beer Chocolate Chunks Chocolate Cake and it was really good too. However I find that this cupcake has a much intense root beer taste to it! This recipe was inspired by Deb from Smitten Kitchen. When I saw it, I knew I had to give it a try. 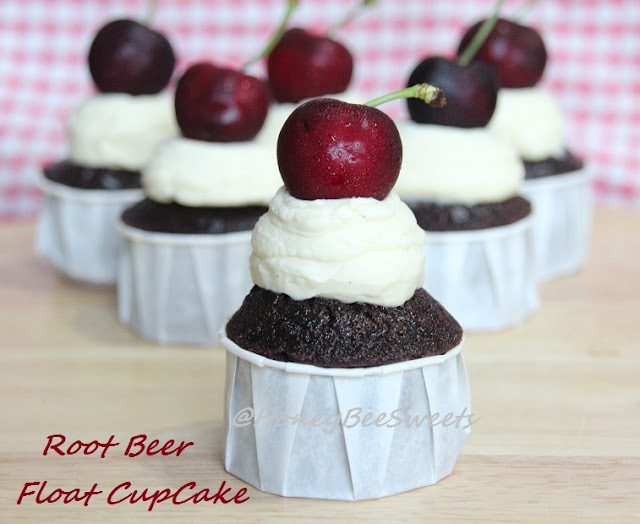 ;) I did several changes to it to match the amount of root beer in a standard can size for easier baking. Preheat oven to 175°C. In a small saucepan, heat the root beer, cocoa powder and butter over medium heat until the butter is melted. Add the sugars and whisk until dissolved. Remove from heat and let cool. In a large bowl, whisk flour, baking soda, and salt together. In a small bowl, whisk the eggs until just beaten then whisk them into the cooled cocoa mixture until combined. Fold the liquid and flour mixtures together in the large bowl. The batter will be slightly lumpy; this is okay. If you overbeat it, it will get tough. Fill cupcake liners about 80% full and bake for about 17 to 20 minutes or till the tester comes out clean. Transfer pan to a wire rack to cool completely. 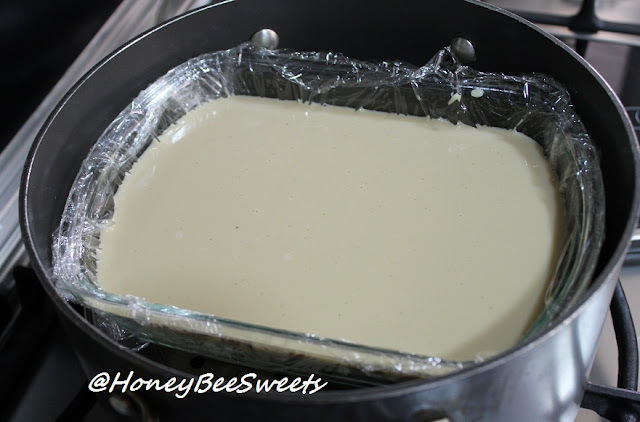 Prepare a double boiler with a gentle simmer. In a heat proof bowl, combine egg whites, sugar and salt into it. Mix well but no beating is required. Place the bowl over the double boiler and placing a candy thermometer to monitor the temperature. Stir once in awhile to prevent the egg white from curdling at sides. Aim to to have the temperature reached at least 146F / 63C for food safety reasons. Once the temperature is reached, remove from heat and beat it till it is silky white. Add vanilla extract and mix well. If the mixture is still hot, place it over a bath of ice water to cool it down. Add the butter chunks one piece at a time and continue to beat while doing so. Continue to beat till all the butter has been added and the buttercream is smooth and silken. Use about 1 cup for the cupcake while you can chill the rest in the fridge for use in future. Since I did reduce the sugar level quite a bit, so with the vanilla SMB, the sweetness is just right. And you know, after chilling it, every bite does gives you that root beer float taste! 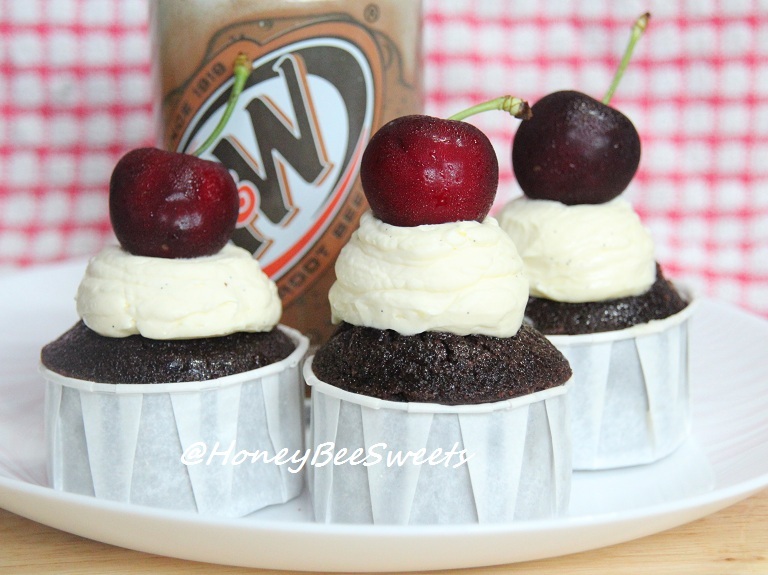 How cool, a favorite beverage recreated into cupcake form, lol! If you like root beer like me, this will knock your socks off! 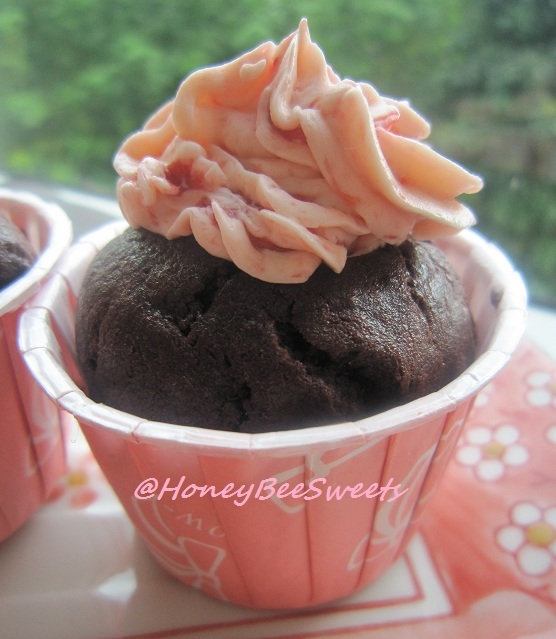 I will be submitting this fun cupcake to this month's Aspiring Bakers #13: Enjoy Cupcakes! (November 2011) hosted by Min of Min's Blog. Thanks Sze Min! Alrighty everyone! Hope you all have a good day now, cheers! Today I'm posting 2 healthful recipes which I am sure anyone can benefit from it. 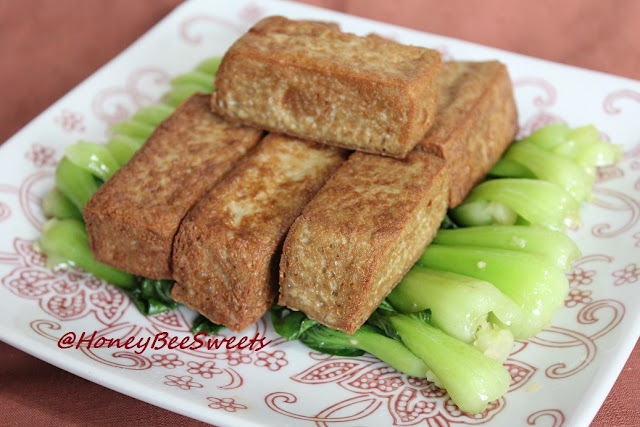 As I have mentioned before, my family loves eating tofu dishes. So I am always on the look out for good recipes. 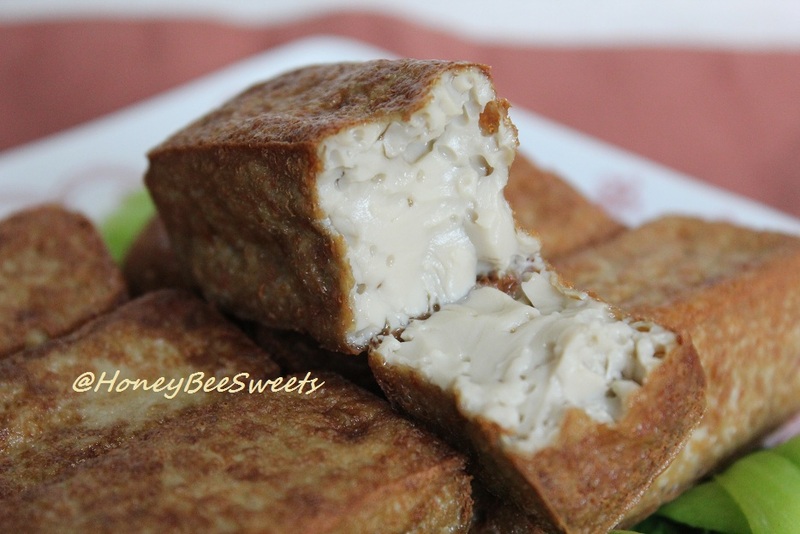 And just the other day, I happened to spot this recipe from Wendy's which pretty much had me when I saw the word steam tofu, lol! 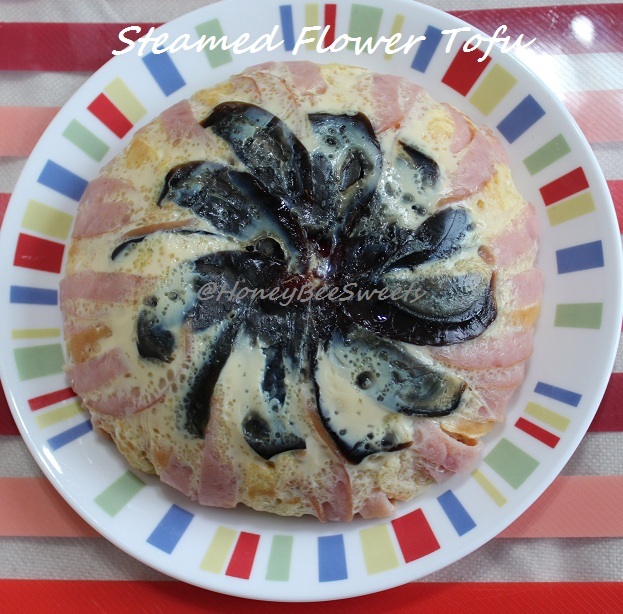 Steamed Flower Tofu, as the name implies, it's pretty to look at plus its healthy because it is steamed. Not forgetting it's so easy to whip up! Line the steam bowl with heat resistance cling wrap, get ready the steamer. 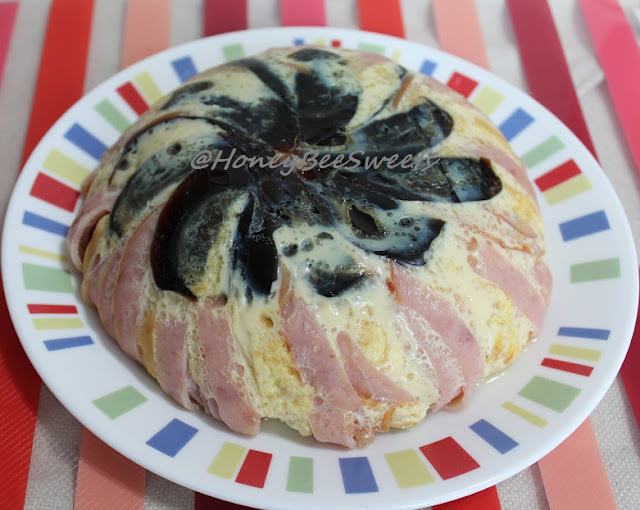 Line the century egg wedges in the center of the bowl in a circular manner. 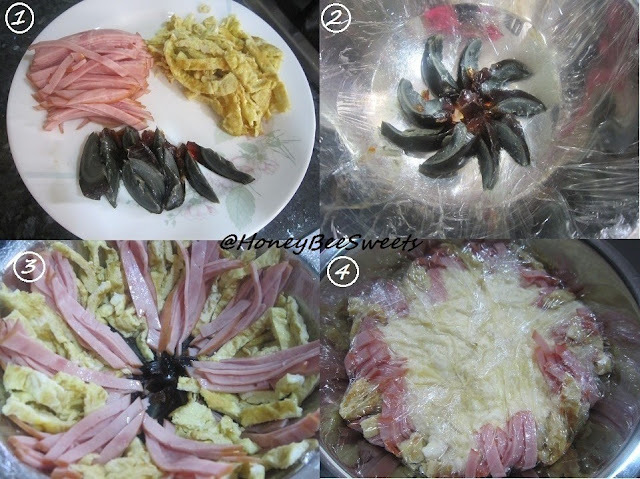 Then line the ham and egg strips along the wall lining of the bowl as well,, alternating each ingredient. In a bowl, mash the tofu and egg with some salt and pepper and mix till well combined. Pour the tofu mixture right in the center of the bowl. Fold down the sides of the cling wrap to tug in the edges of the ham and egg strips. Place in the steamer and steam at medium high for 20 minutes. Let cool for 10 minutes before flipping out on a plate. How easy is that?! It has already become my family favorite, I already made it twice and planning to make it again this week. :D Do try it, it's very good! The second recipe is call Pear Soup with ChuanBei (川贝蜜枣雪梨汤). Okay, let me clarify, this is a sweet drink but a savory soup that you serve during dinner time. It's medicinal purpose mainly is to remove heat, stop coughing and clear phlegm. How I came about knowing this soup was that my husband loves to order it at Hong Kong airport whenever we transit there. He said he had it before way back at a Hong Kong restaurant in San Francisco and likes it very much. After realizing this, I was pretty determine to find out how to make this drink. 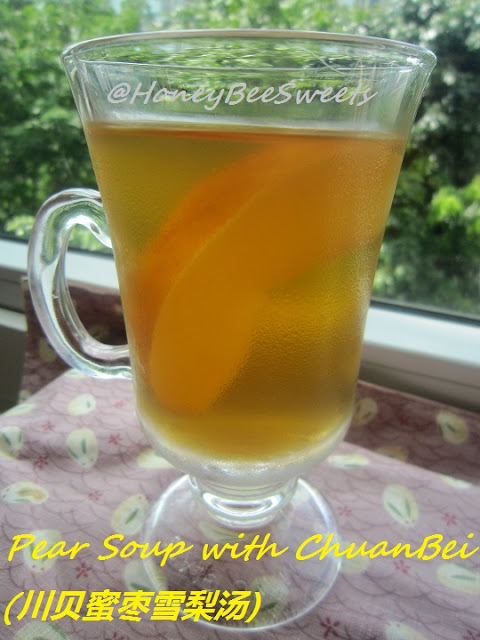 Luckily, I found it in a soup recipe book call "The World of Nourishing & Fine Soups"! 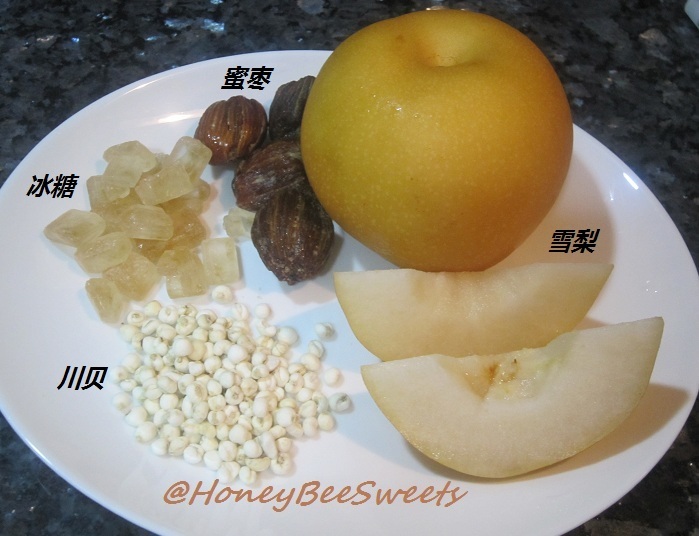 Cut pear into halves and remove core. Put all the ingredients into stewing pot, pour in water and cane sugar, stew for 2 hours. Serve when still warm. Chill is very nice too but might defeat the purpose of removing phlegm and cough. no? Okay, got to go for now. You all have a good week ahead! Cheers! 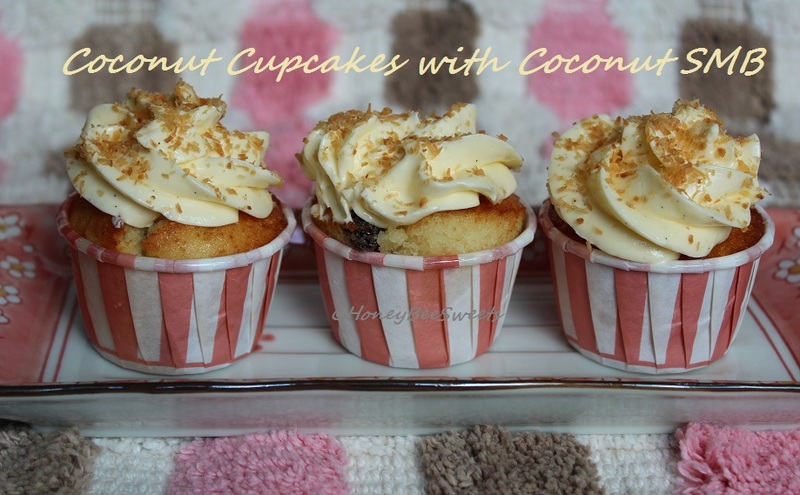 I have decided to dress up the coconut cupcakes by topping it with Coconut Swiss Meringue Buttercream and some toasted coconut flakes. 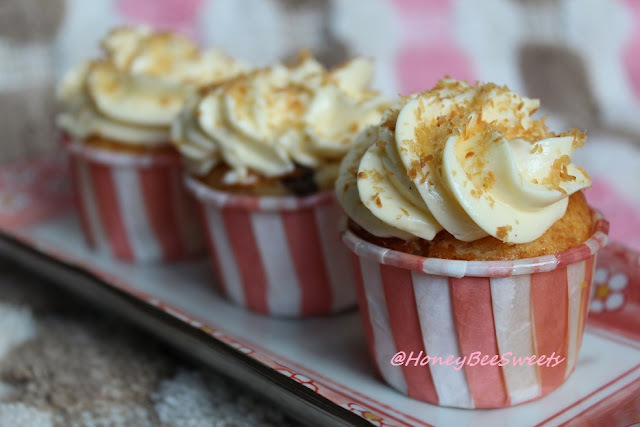 (^_^) Although the cupcake itself is already moist with nice coconut scent, but with the SMB, it becomes real decadent and even more delicious! I was please that even my 2 kids whom are not fond of coconut flavor found these good. :) But I believe it has something to do with the SMB....they just LOVE Swiss Meringue Buttercream! They kept saying it taste like ice cream after it's chilled, lol! In a mixing bowl, cream the butter and sugar till light and creamy. Then crack in one egg at a time and mix well after each addition. Then sieve in the coconut powder, flour, baking powder and mix till just incorporated. Finally, add in the desiccated coconut flakes and raisins and stir to blend in. 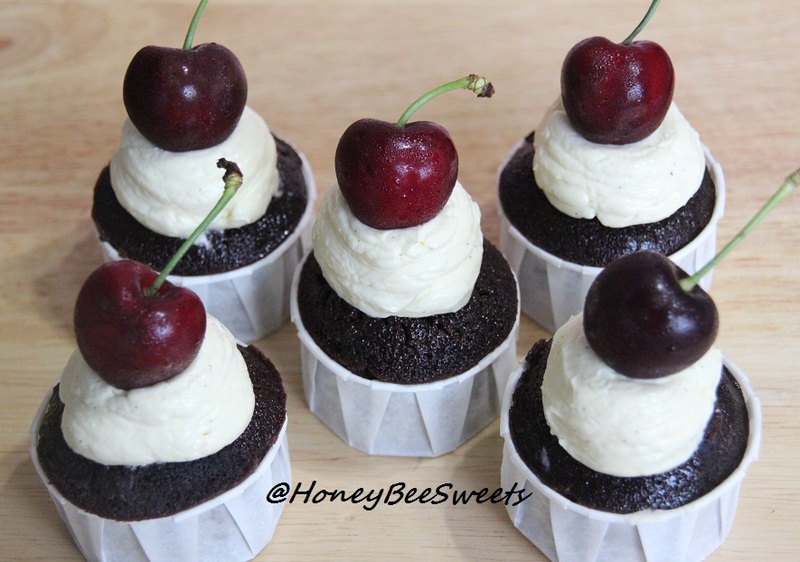 Scoop batter into cupcake liners till 3/4 full. Then bake them in the preheated oven for 15 minutes till the tester comes out clean. In a small bowl, weigh out the coconut powder, then add in 2 - 3 tbsp of hot water, mix well till it all the powder is incorporated. Mixture should be slightly thick. Let cool before mixing into the Swiss Meringue Buttercream. Once mix in, chill it till needed. For the toasted coconut flakes, place about 1 heaping tbsp of desiccated coconut flakes on a non stick frying pan at medium low heat. Stir fry it constantly and try not to burnt it. Once it turns light golden brown, remove from fire and let cool completely before sprinkling over the cupcakes. 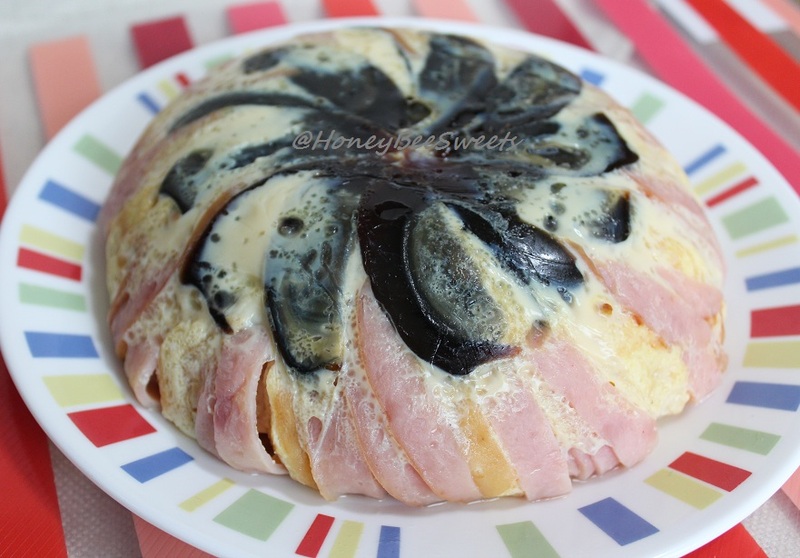 A look at the inside of this moist tender cake. With a cup of nice hot tea will be perfect! Try it out folks! 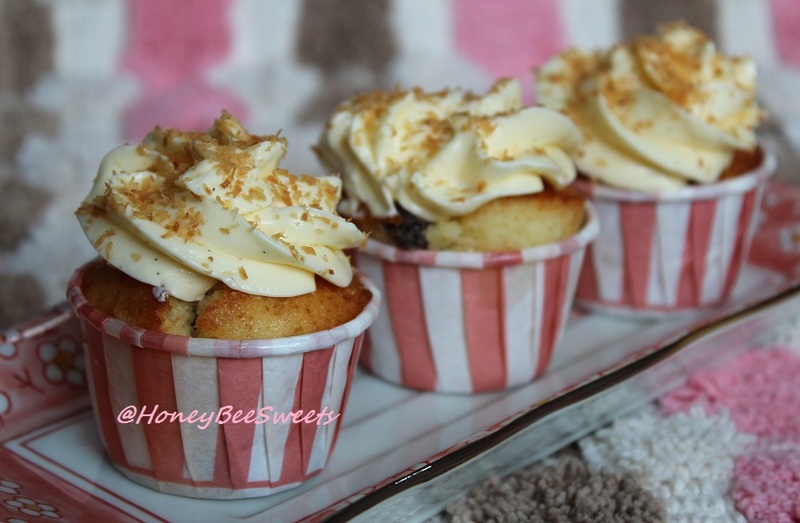 I am happy to submit this to this month's Aspiring Bakers #13: Enjoy Cupcakes! (November 2011) hosted by Min of Min's Blog. Thanks so much for hosting this month Min! Take care all and have a great weekend! If you ask me if I have ever made tofu before a year ago from now, I would probably laugh it off and claim its really silly and quite a waste of time. Well I can't exactly rule out the latter completely since it does take time to make it as compared to just grabbing a ready made box in the grocer. I still remember when I first saw Wendy posting up her recipe, I was amazed. For something you can get for less then a buck...seriously? But I have to admit, somewhere inside, I was curious and eager to know how to do it...especially if I can do it myself, lol! After 2 attempts, I finally conclude that, it ain't really that silly and it was worth doing it from scratch....well sometimes, lol! A simple healthy fried egg tofu served over some stir fried greens. In my household, we serve tofu at least twice a week, be it steamed, stewed or fried. We love tofu! 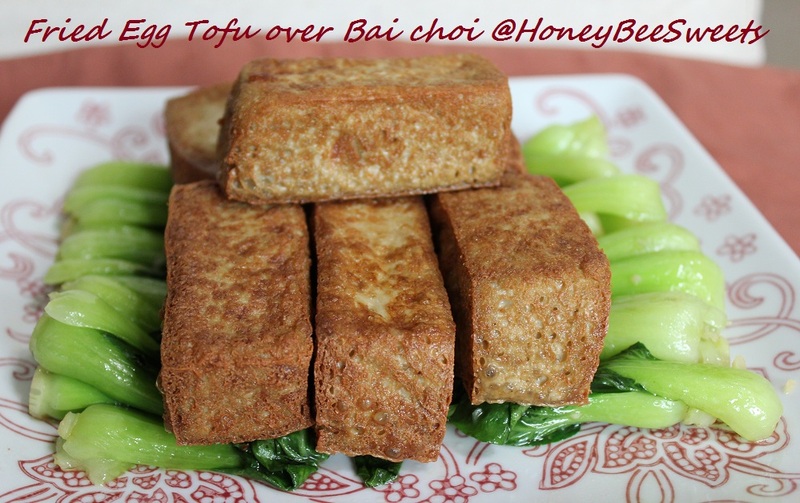 In fact I will be posting up a some of the tofu dishes that I serve at home in the coming weeks. Of course, prior to having homemade tofu, you gonna churn out some homemade soy milk! I make soy milk quite often at home, in fact I love serving it warm with you tiao or Ham Chim Peng on a weekend morning, yum! 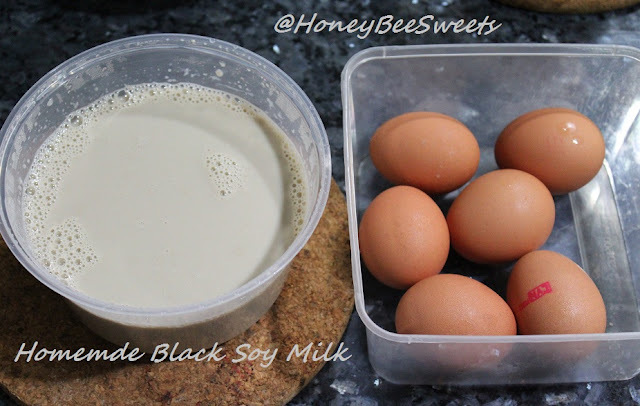 This time round, I have opted to try out black soy beans for this recipe. Taste and texture wise, no difference, just a slight grayish shade that's all. Crack all six eggs in a large bowl, add salt and beat it up lightly. Pour in the soy milk and stir gently yo blend well. Add in the cornflour mix and stir well. Strain the whole mixture and set aside for use later. Get ready the steamer. Line a heat proof cling wrap on your steaming container. Pour the soy milk mixture in carefully. Then cover it with another cling wrap which will prevent the steam water from dripping over the tofu. Steam at low fire for 30 minutes. Let cool completely before removing and cutting it. Note that the key to making a smoother tofu is the straining of the mixture and steaming it at low fire. Well, that's about it. It is not that complicated to make it right? 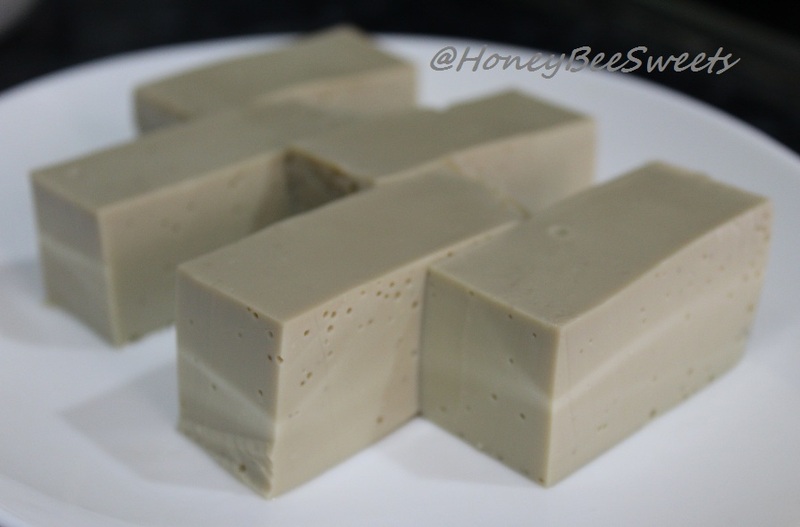 But please don't get the impression that I am so darn free as to make tofu whenever I need it, lol! 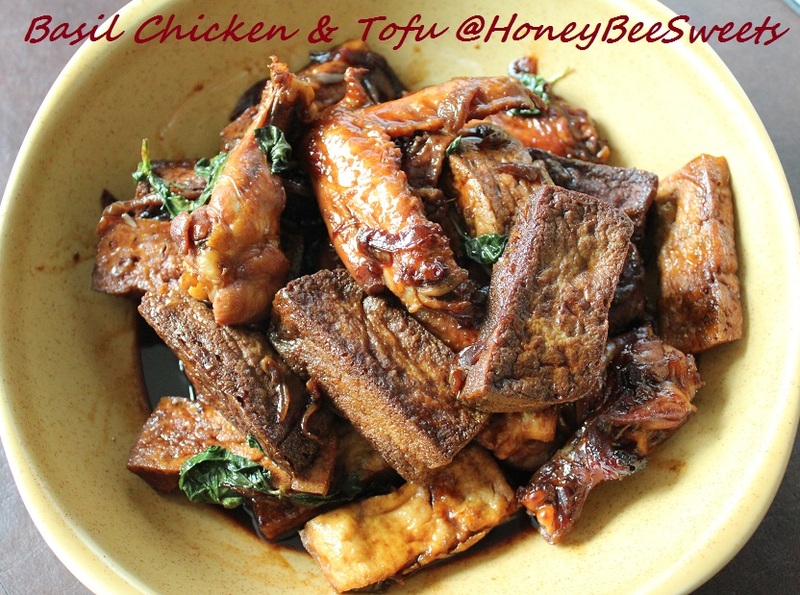 I reserved half of the egg tofu to make this Basil Chicken and Tofu (similar to Three Cups Chicken) the following day. I added some store bought tou gua (pressed tofu) plus the ones I made. Not trying to boast, but the homemade ones are definitely so much more tastier and flavorful! 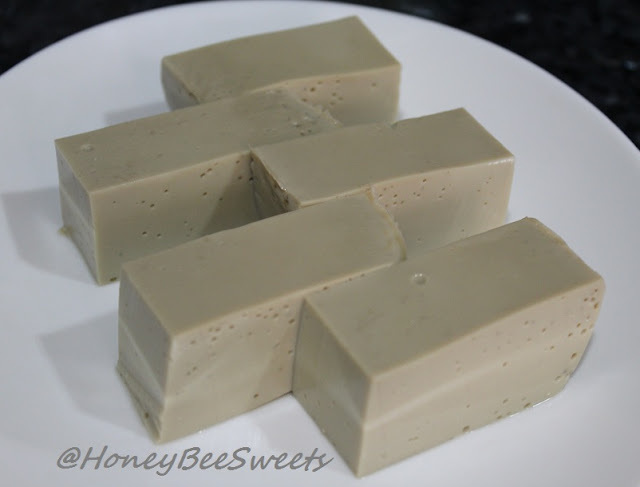 I am glad I tried making some tofu and will probably make it again when I get the mood (plus free time). Obviously, I have much to learn about this new toy. 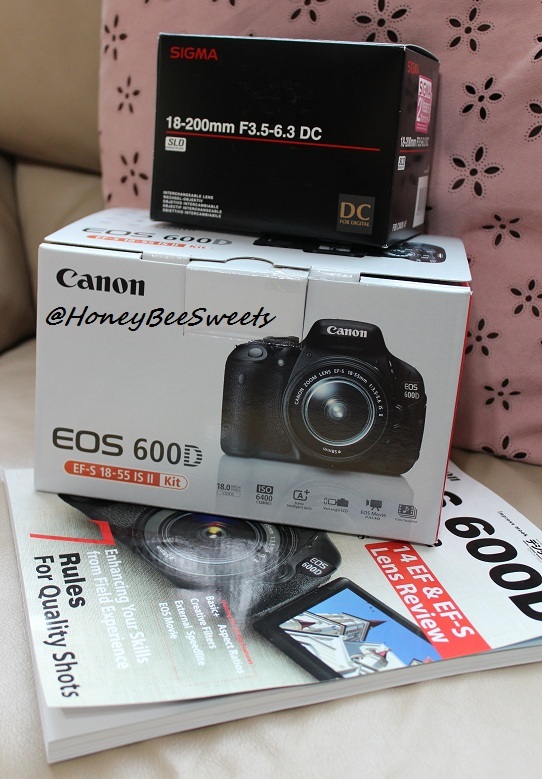 Hopefully will produce more quality photos on my blogs in future. ;) Gonna leave you all on this happy note and hope everyone has a wonderful and restful long weekend! Cheers! Chocolate and banana, the perfect combination to a delicious desert. No matter how you combine them, they still taste good. (^_^) I then realize I have yet baked a cake that blends both chocolate and banana in it. Well, it's never too late right? And when I found THE recipe from Dorie Greenspan's book "Baking from my home to yours", I knew I had to try it! 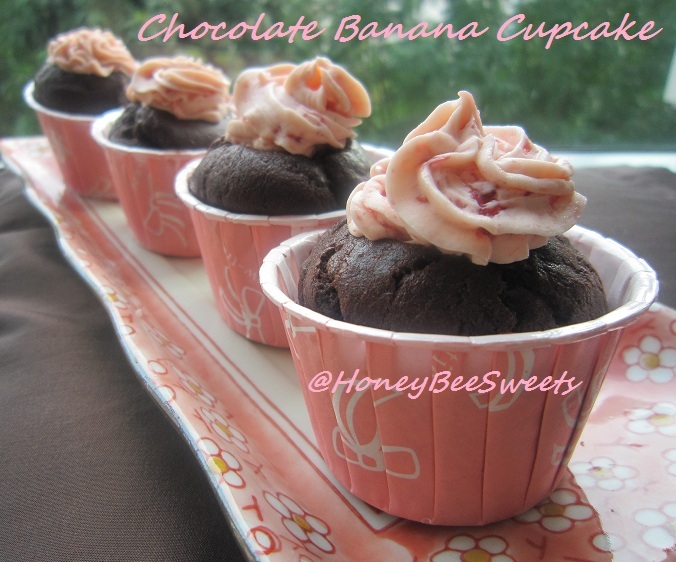 Since I have some ready ripen bananas around, what better excuse then to bake some right away? Preheat the oven to 175C. Line a baking tray with some cupcake liners. Then sift together the flour, cocoa, baking powder, salt and baking soda. In a mixer bowl, beat the butter until softened. Add the sugars and beat for 2 minutes more. Add the eggs one at a time, beating for a minute after each addition. Reduce the mixer speed to low and mix in the mashed bananas. Add the dry ingredients in 3 additions, mixing only until they disappear into the batter. Still on low speed, add the buttermilk, mixing until it is incorporated. Stir in the chopped chocolate. Divide the batter equally among the cupcake liners, filling them to about 3/4 full. Bake for 14 to 15 minutes. or until a tester comes out clean. Transfer the pan to a rack and coo. Will be submitting it to this month's Aspiring Bakers #13: Enjoy Cupcakes! (November 2011) hosted by Min of Min's Blog. 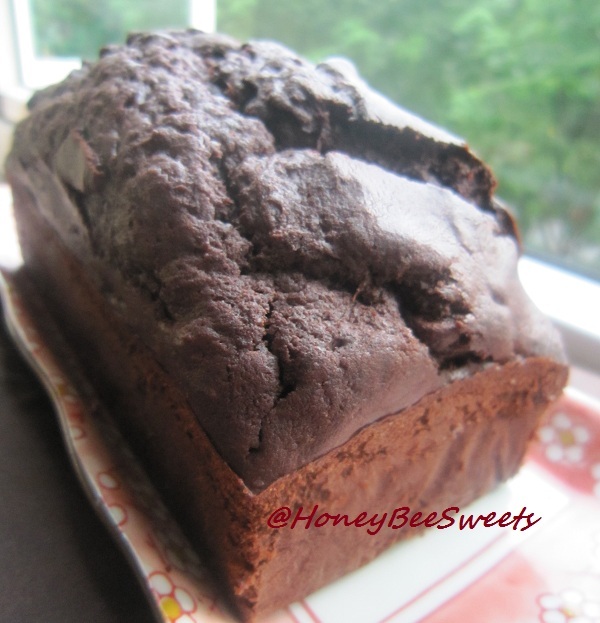 I actually made a loaf with half of the batter and it was equally good. :) But the brown is kind of dark, it scares me a little, lol! 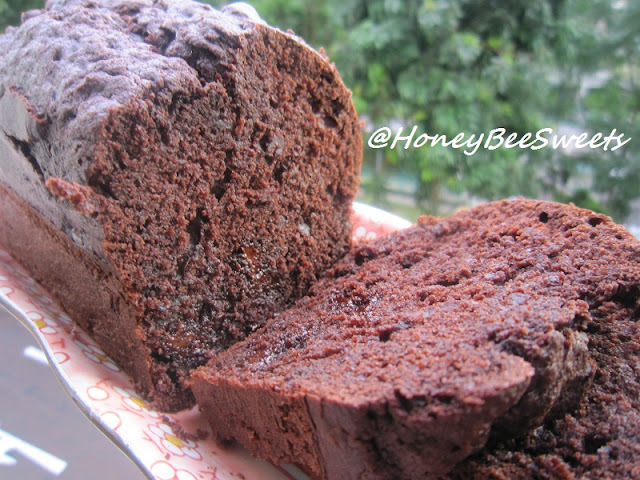 If you like a chocolaty cake with slight banana scent, this would be the one for you. 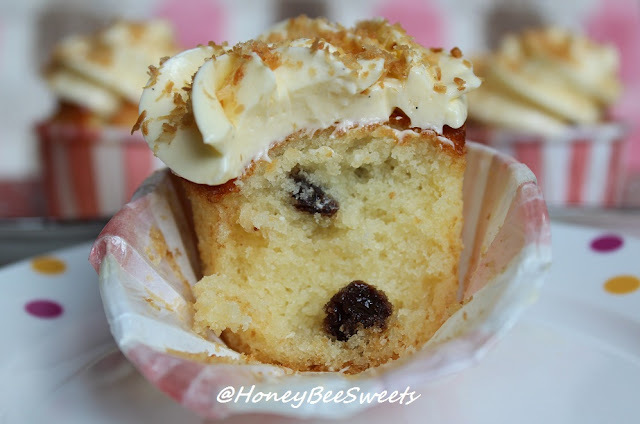 The cake is moist and adding the chocolate chip is also key to making it great. Try it! Okay all, have a nice day! Cheers!